Go stand on the beach on the west end of Dauphin Island today, look south at the beautiful Gulf of Mexico, and imagine going back in time to when Alabama became a state. Dauphin Island, seen from the extreme west end, seems to be growing a narrow, courling tail since Hurricane Katrina struck in 2005. This knife edge of a new beach separates the Gulf water seen on the right side of the picture from the Mississippi Sound seen on the left side. The Island has brown about 300 yards longer since Katrina chopped it in half. The other half of the island, which is about 8 miles long, lies to the west across nearly a mile of open water. Instead of being on the Gulf beach, you would have been standing in the waters of Mississippi Sound looking at the back (north) side of the Dauphin Island of 1819. This is because the west end of the island has migrated more than 1,000 feet - more than its entire width - to the north since 1850. Descendents of Europeans have lived on Dauphin Island for more than 300 years. But that is on the east end of the island, the "village" in the maritime forest, behind the extremely high sand dunes that protect that middle part of the island from hurricane storm surges and Gulf waves. There is a tremendous amount of sand moving onshore from the migration of Pelican/Sand Island onto Dauphin Island near the now land-locked fishing pier and the golf course. The same thing has probably happened for thousands of years including 150 and 300 years ago. Meanwhile, both ends of the island have suffered from major storms and chronic erosion. The rock seawall built by the U.S. Army Corps of Engineers in 1906 and rebuilt in the 1990s has protected Fort Gaines from succumbing to beach erosion like Fort McRae - the fort that used to sit on the west side of Pensacola Pass. However, there is no beach in front of the seawall around Fort Gaines, and there is severe beach erosion immediately to the west of the seawall. A seawall is probably not desired, nor is the public expense justified, on the west end of the island. The tremendous migration of the west end of Dauphin Island to the north since 1850 is due to two natural processes: storm overwash and inlet breach formation/healing. Both have occurred repeatedly. Storm overwash is most obvious during hurricanes like Frederic, Georges, Ivan and Katrina, as storm surge rises to an elevation where waves roll right over the smaller dunes on the west end. However, once the dunes are flattened, the overwash occurs in much smaller storms. The west end of the island has overwashed more than half a dozen times some years. The overwashed sand moves into Mississippi Sound, leaving former boat docks high and dry in the sand while the Gulf beaches move permanently to the north, too. The barrier island is rolling over to the north. There is no precedence for living on a barrier island that overwashes as frequently as the west end of Dauphin Island has been overwashing recently. Most of us remember (just 20 years ago) when Bienville Boulevard was located on the northern portion of the west end of the island. Today, it is on the southern portion of the island near the surf. And the road location hasn't moved: The island has rolled over it. The road is so close to the surf today that it is essentially where the primary sand dune field should be located on the island. The repeated breaching and healing of new inlets may be just as important for island migration in the long run. The west end of the island has been breached repeatedly over the last 300 years, including today's "Katrina Cut" west of the end of the road. Other similar breaches located between there and the Little Red Schoolhouse are documented in the 1850s, the 1910s, 1920s, 1930s and 1940s. Today's "Katrina Cut" is over a mile wide and sand is moving north into Mississippi Sound due to waves and incoming tidal currents. While each of the previous breaches has eventually sealed itself off due to wave-driven sand transport along the beaches, the island and its Gulf beaches have re-established farther north each time. The "Katrina Cut" may seal itself off in the next decade, but it will do so with the island and the beaches even farther north. In the meantime, it will continue to cause tremendous changes in the Mississippi Sound, including wetland losses and a decimated oyster fishery. So, is there a solution? 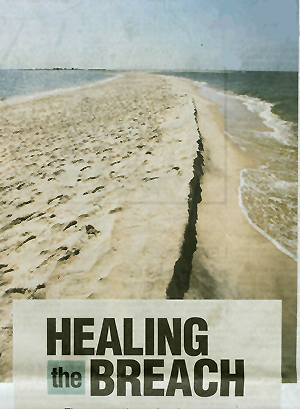 The so-called "FEMA berms" built twice on the west end of Dauphin Island in the last decade did not solve the problem. They cannot if the Corps of Engineers just stacks a relatively small, expensive amount of sand on the beach face. Attempts to build something similar yet again seem misguided. There are only three general approaches to an erosion problem such as this: retreat/abandonment, stabilizing with "hard" structures such as a seawall, or stabilizing with "soft" solutions such as beach nourishment and sand bypassing. The recently announced federally funded studies will focus on beach nourishment - the placement of large amounts of good-quality sand on the beach to widen the beach and, in this case, establish a dune system. Beach nourishment has worked very well for Gulf Shores and Orange Beach. Their beaches are, on average, much wider and higher than they were in 2000. The 2001 beach nourishment project in central Gulf Shores has probably paid for itself a dozen times over in reduced storm-induced damages to public and private property. The Dauphin Island studies will determine how much sand is needed, find the most cost effective sand for nourishment, model the expected future behavior of the new sand and the environmental impacts of the project, and estimate the costs of initial construction and future maintenance. Dr. Scott L. Douglass is professor of civil engineering at the University of South Alabama and author of "Saving America's Beaches: the Causes of and Solutions to Beach Erosion."